Schoolwork is an iPad app built to help teachers unlock their student’s potential. Teachers can share class materials, assign activities within apps and view student progress in real time. Schoolwork allows the user to tailor instructions based on ‘individual needs’. Students have one place to see assignments, submit work, and view their own progress. A. Available to any education institution enrolled in Apple School Manager and uses Managed Apple IDs. School Manager is supported in 34 countries. Q. What’s the difference between Classroom and Schoolwork? A. Classroom allows teachers to manage their student’s devices and ensure they keep on track with their workflow: Lock features, real-time viewing of student screens, and the ability to reset passwords. Schoolwork is an app that was designed to address teacher and student workflow both in and out of the classroom. Assigning work to students has never been easier with features like Handouts, collaboration and app activities. Teachers can also keep up with students. Seeing their progress allows for personalized and tailored instructions based on the needs of individual students. Q. Which apps work with Schoolwork? A. Top education apps like GeoGebra, Nearpod, Tynker will work along with Swift Playgrounds and iBooks. Apple app developers are working hard to implement the new ClassKit framework before the back to school season. Q. How does Schoolwork work with Apple’s other education tools? A. Schoolwork was designed to work within Apple’s ecosystem and with its education tools, as well as third-party apps. Schoolwork accesses class roster info directly from Apple School Manager so everything is set up already! Just sign in with your Managed Apple IDs. Keynote, Pages and Numbers integrate with Schoolwork, so teachers can collaborate on a document with the whole class or individual students. Students can also submit their work from within the apps, when teachers share a file with students or students submit their work, Schoolwork organises them into dedicated class folders in iCloud Drive so they’re easier to find later. Teachers using classroom can also navigate students to a specific document in Handouts during class. Q. What kind of student progress data will be available? Q. Can a parent have their child removed from student progress recording in Schoolwork? A. Yes, the school can disable student progress recording for any individual student in Apple School Manager. The student will still be able to use Schoolwork, but their activities won’t be reported. Q. Are parents able to view their child’s progress data in Schoolwork? A. Yes, parents can view their child’s data by opening Schoolwork on their child’s iPad by viewing the data in Settings. Schoolwork lets you access and monitor student progress in real time! Q. Does Schoolwork protect student privacy? Q. When will Schoolwork be available to schools? A. Schoolwork is scheduled to become available to education institutions in summer 2018. Q. What setup is required for Schoolwork? A. Once you set up your Managed Apple IDs and class information, it’s all ready for teachers and students when you open Schoolwork. When classes change or students rotate in and out of a class, the information is updated automatically, student progress recording is optional and can be enabled or disabled in Apple School Manager. Q. Can a teacher set up Schoolwork without IT? A. Schoolwork relies on class rosters created in Apple School Manager. Teachers, as long as they have the necessary permissions in Apple School Manager can set up roster information and use Schoolwork for Handouts, app activities and collaboration. Progress recording is only available if enabled by the school. Q. Will materials shared on Schoolwork count towards storage limits? Q. What’s the difference between iTunes U and Schoolwork? A. iTunes U focuses on its delivery of large collections of courses from leading schools, universities and cultural institutions. Schoolwork’s primary focus is simplifying the workflow for teachers, which makes it easier for them to personalize instructions and grant insight into student progress across apps they use. Q. Can schoolwork and iTunes U be used together? A. Schoolwork can be used to help navigate students to content in iTunes U courses. Materials can also be exported in private iTunes U courses to iCloud to use them in Schoolwork Handouts. Q. Does Schoolwork replace a customer’s learning management system (LMS)? Q. Does Schoolwork work on MacBook or Chromebook? A. Schoolwork is an iPad exclusive app. However, teachers can also access Schoolwork from a web browser @ www.icloud.com. A. This is the new framework that developers use to enable their apps to be used with Schoolwork. 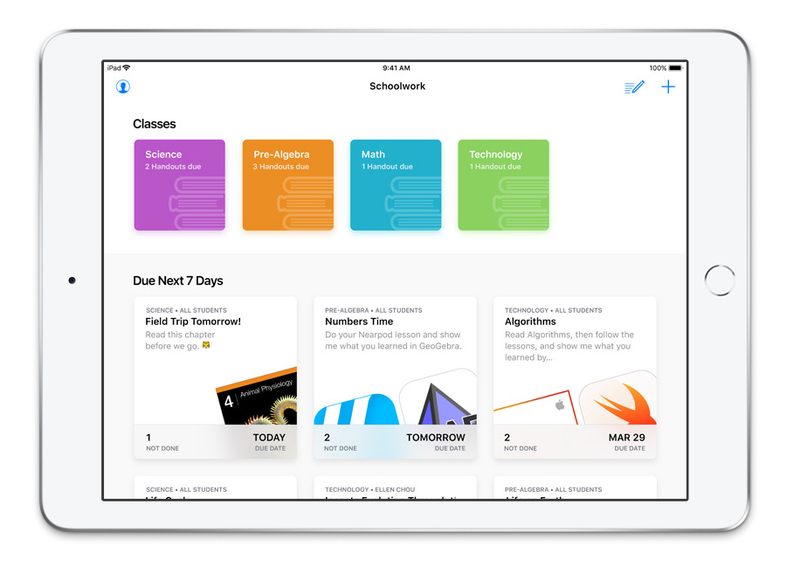 ClassKit is part of iOS 11.3, developers can begin adoption today, even before Schoolwork is available to schools. Developers can learn more about it at developer.apple.com/classkit. Apple has made it clear that they are releasing more and more support for both teachers and students, visit our website and find out why we have been leasing to schools for over 30 years. To see what the iPad can do for your classroom and if you have any other questions give our dedicated Apple team a call on 0207 1111 643 or talk to us online using our WebChat feature.